The Pro Housing Cutter’s adjustable-size grip is comfortable for all hand sizes and an integrated awl helps clear the way for smooth cable operation. Hardened SK5 steel blades are formed to cleanly cut shift and brake housing. Integrated awl in the base of the handle can be used to open up cut housing ends. Ergonomic handle and adjustable reach ensure all-day comfort for both small and large hands. 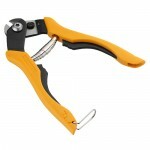 2-sided cable tip crimper is built into the arms.